A well played bagpipe at a Funeral adds an air of grace and dignity to the occasion that few instruments can match. It is important that the piper is sensitive to the wishes of the bereaved, hence I am more than willing to play or learn any special tunes and to fit in with your requirements. I can also provide suggestions if required. I am regularly employed by Tobin Brothers Funerals, Classic Funeral Services, Kingston Funerals, Nelson Bros Funeral Services, Le Pine Funerals, W.D. Rose & Joseph Allison Funerals, Allison Monkhouse Funeral Directors, Templeton Family Funerals, Edward (Ted) Bull & Daughter Funeral Directors, Hall's Funeral Services, Australian Pensioner Funerals, TJ Scott & Son Funeral Directors, Kings Funerals and many others, all of whom value the quality of the service I provide. Play a selection of suitable tunes as mourners arrive at the chapel. Lead the casket from the hearse into the chapel. Lead the family into the chapel. Play during the reflection or photo presentation. Play during the committal as the casket disappears from view. Lead the family out of the chapel and continue to play as mourners gather outside. Lead the casket from the chapel to the hearse. Lead the hearse away from the chapel. Lead the hearse to the gravesite at the cemetery. Lead the casket from the hearse to the gravesite. Play a selection of tunes afterwards, usually at a distance. 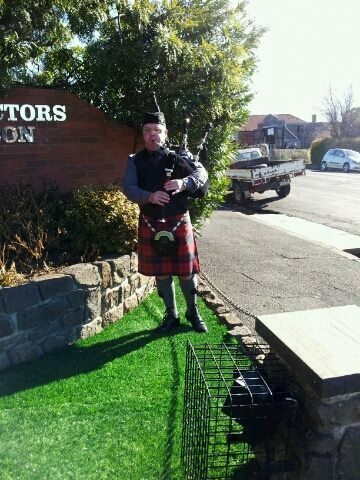 Piping at a Funeral in Kyneton.